AKVA Group reports that they have entered into strategic partnership with Sperre AS. Sperre AS is a leading player in ROV technology. For a number of years the company has developed, produced and sold ROVs (Remotely Operated Underwater Vehicles) from its plant at Notodden in Telemark. The products from Sperre AS are renowned for high quality, and are widely used in the aquaculture industry in Norway. AKVA group ASA supplies technology solutions and also has an extensive service offering with workshops and competent staff that handle the needs of the aquaculture industry along the coast where the aquaculture facilities are located. AKVA Group reports that the first result of this strategic partnership is the development, production, sale and service of a remotely operated cleaning rig. Sperre AS has developed the product, and AKVA group is responsible for marketing, sales and service. 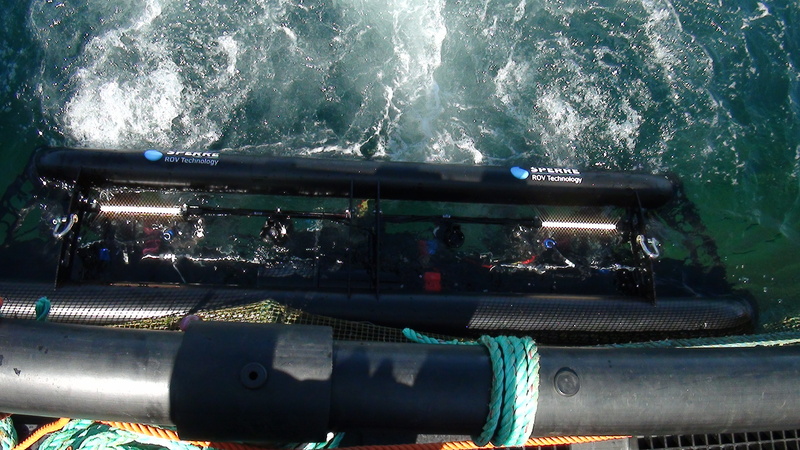 The unique feature of the new cleaning rig is that it “swims” along the net line in the pen and cleans using high-pressure seawater. Nothing takes hold of the net that can damage and tear holes in it. This greatly reduces the risk of escape. Flying Net Cleaner is based on a patent pending principle that ensures that the rig is in balance regardless of whether it cleans horizontally, vertically or upside down. This makes it easier for the operator to select the cleaning direction that is most appropriate, regardless of which type of net one is dealing with. The speed of the cleaning rig is important for those performing the job. Flying Net Cleaner can achieve a cleaning efficiency far greater than what competitors currently have on offer. AKVA group supplies and offers service for high pressure generators customised for the new Flying Net Cleaner. The pumps supplied are from Kamat or Hammelmann. Both pumps are quality products that are specially adapted to the environment one encounters during pen cleaning. Although Sperre AS’s products are renowned for reliability, the partnership between Sperre and AKVA group will give customers peace of mind that access to spare parts and expertise is not far off. AKVA group’s service bases and staff will also be available for Sperre AS’s ROV customers so that they have access to local and thus faster service for products. Uptime is essential for users of equipment for services, and this partnership ensures that both companies will contribute to customers experiencing better service for their products.